Being focused on nutrition and what you eat doesn't mean you have to skip desserts and treats, especially during the holiday season. Eating as well as you can during cancer treatment is an important part of recovery. But being in treatment doesn’t have to mean avoiding all of your favorite seasonal flavors and treats. This collection of guilt-free indulgences highlights sweet treats all under 200 calories a serving. The recipes also include ingredients that can help soothe side effects of cancer treatment and accommodate appetite changes. Before making any drastic changes to your diet, be sure to talk with your doctor or nutritionist. While these recipes may relieve common symptoms, your doctor may have you on a specific diet for your treatment plan. If you have questions about what’s safe to eat or drink, your doctor or care team are ready to help. At 65 calories a serving, these petite treats blend festive spices and pumpkin puree. 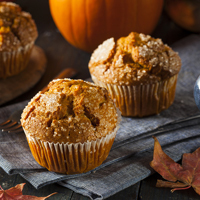 These muffins can help ease nausea and taste alteration side effects. Light and airy, these meringues are gluten-free and call for less sugar than most traditional recipes. What’s more, they’re packed with vitamin E, manganese and cancer fighting phytochemicals—thanks to the roasted hazelnuts. A holiday classic, this tasty recipe blends traditional ingredients at only 75 calories a serving. If you like a soft and chewy cookie, try chilling the dough after it’s mixed. Popping your cookies into the oven at room temperature will keep cookies crisp and crunchy. This simple dessert has a mild taste and is easy to prepare. 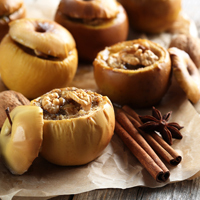 These baked apples are good for anyone dealing with side effects such as nausea, constipation, sore mouth, difficulty swallowing and taste alterations. This material is furnished for informational purposes and is for your personal use only. It is not intended as a substitute for the expertise, judgment and specific advice of your doctor. Based on your condition and treatment plan, you may have different dietary needs. Please talk to your doctor before making changes to your diet plan. Baked Apples With Cinnamon and Pumpkin Ginger Mini Muffin recipe reproduced, with permission, from Jeanne Besser et al., What to Eat During Cancer Treatment (Atlanta: American Cancer Society, 2009) 124. ©2009 by the American Cancer Society. 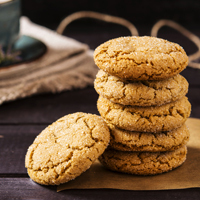 Gingersnaps Recipe. Adapted Oct. 3, 2017, from http://www.aicr.org/health-e-recipes/2014/gingersnaps.html. 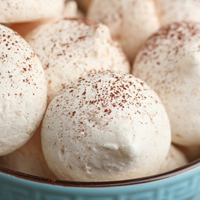 Hazelnut Meringue Kisses Recipe. Adapted Oct. 3, 2017, from http://www.aicr.org/health-e-recipes/2013/hazelnut-meringue-kisses.html. Will Sugar Make My Cancer Grow?